I had the great pleasure, the other day, of having lunch with the man who was a great resource and influence for me as I got back into fly fishing, some 20 years ago, and who later encouraged me to begin writing about it. It had been too long since we'd last gotten together and I was thrilled to see him doing well. 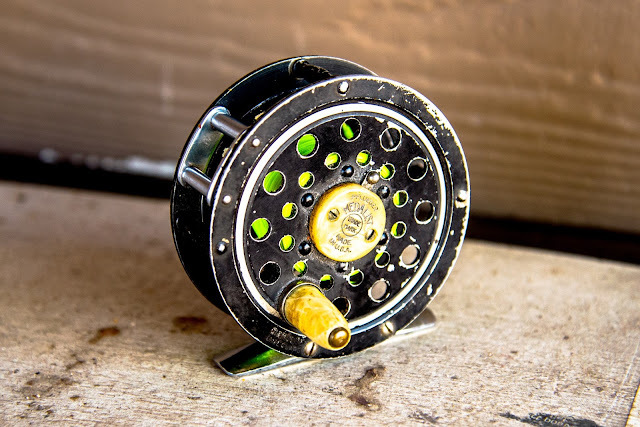 As we parted, he called me over to his car and handed me this well-loved Pflueger 1492. There's no telling how many trout it had connected with over the years, but, knowing him, a lot. The next day he sent me a link to a webpage that showed the history and progression of these Medalists, challenging me to identifying its age. It's just like him to not simply give me something, but to also make me reach, to teach me something with it; a gift more valuable than the reel itself. I owe the man more than he'll ever know, as do many who he's mentored over the years, fly fishing and otherwise. We should all have such positive role models in our lives. Nice reel. I just changed over a few old clicker reels from RHW to LHW. Thanks for the read. Thanks, Kevin. He's a good man. There ain't no changin' this puppy, Josh. She's a righty only. Actually, as I sit here and play with it, the drag and the retrieve are only marginally different, so why not spool it lefty? Small stream reel anyway; only a line holder, when you come right down to it.